Take that dummy! Niklas Lang takes his best shot. 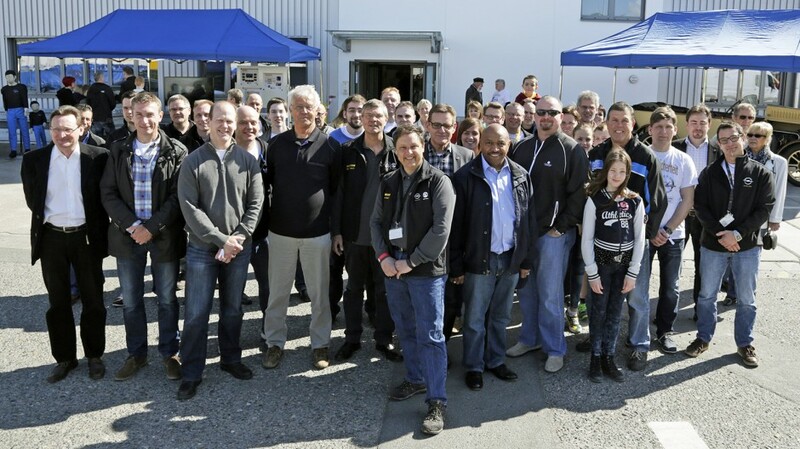 Vehicle Engineering VP Charlie Klein has reason to be pleased: The new P4 is finished and the employees are happy. Listen up: Superiors and other visitors listen to the opening speech held by Günter Schmall. 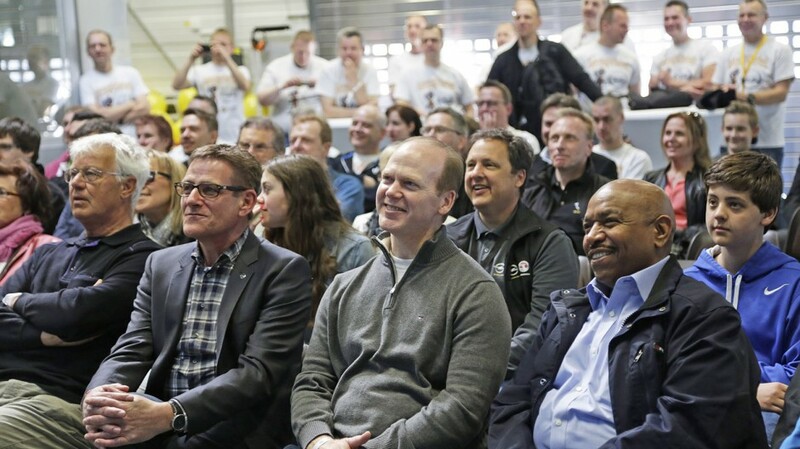 Applause: Wolfgang Schwenk, Director GME Vehicle Safety Integration, is delighted with the event. Crashing the party: The demonstration tests fascinated young and old during the family day. 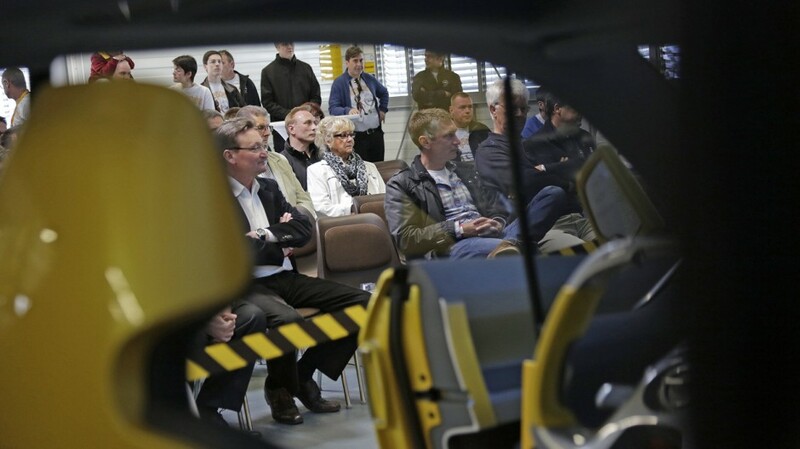 View through a crash car: Two new test benches will be added to the location in which the family day took place this week. Group photo in front of the new P4: Employees and managers smile in the glorious sunshine. The colleagues of the safety department give a rare insight into their daily work. Nimm das, du Dummy: Niklas Lang schlägt zu. Entwicklungschef Charlie Klein kann zufrieden sein: Das neue P4 steht – und die Belegschaft ist zufrieden. Aufgepasst: Vorgesetzte und andere Besucher lauschen dem Eröffnungsvortrag von Günter Schmall. Applaus, Applaus: Entwicklungsdirektor Wolfgang Schwenk freut sich über die gelungene Veranstaltung. Guck mal, wer da crasht: Die Demo-Tests ziehen auch die jüngsten Besucher des Familientags in ihren Bann. Durch’s Crashcar geblickt: Wo am Samstag der Familientag eröffnet wurde, halten in dieser Woche weitere Prüfstände Einzug. Gruppenbild vor dem neuen P4: Führungskräfte und Belegschaft strahlen mit der Sonne um die Wette. The dummy really has its work cut out. For an eleven-year-old, Niklas Lang delivers a remarkably hard and precise blow to the ribcage. “Can I hit him on the nose too,” Niklas asks his father Torsten Lang – he knows what is expected of him. He gets permission. 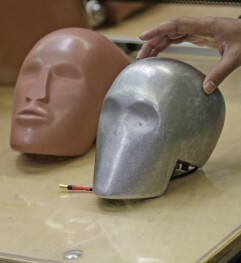 Beating on a crash-test dummy is obviously fun but it is also vital for the Safety colleagues so that they can measure and document the forces. “We want to demonstrate that, no matter how hard you hit the dummy, you will never even get close to the forces he would have to resist if involved in a car crash without wearing a seat belt,” explains Holger Hochgesand, who organizes the Safety family day together with Bettina Williams, Oliver Renard, Olaf Allgeyer, Wolfgang Becker und Michael Reber. Cross section: The secrets of a passenger compartment are revealed. Reunited after many years: Helmut Döhn, Hans-Karl Hamm and Kurt Jung (from left to right) inspect the changes to their former workplace. Times are changing: That also applies to dummy styling. The completion of the new P4 took some time but the Safety employees will definitely agree that it was worth the wait. 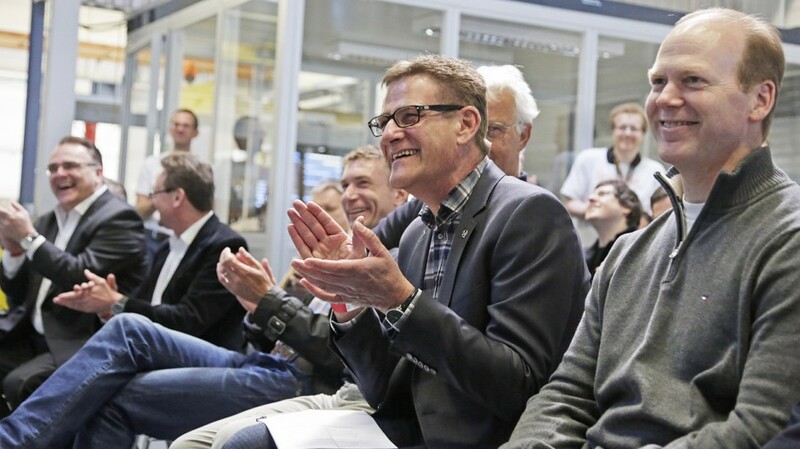 “We know have much more office, analytics and workshop space,” said a delighted Holger Hochgesand. “Everything is under the same roof now and that will help us work even better as a team.” Two new test benches will also be installed in the next few days. “We need them to meet the latest legal requirements that have just come into force in the USA,” explains the safety specialist. Vehicles for the US market are also tested and engineered in Rüsselsheim. 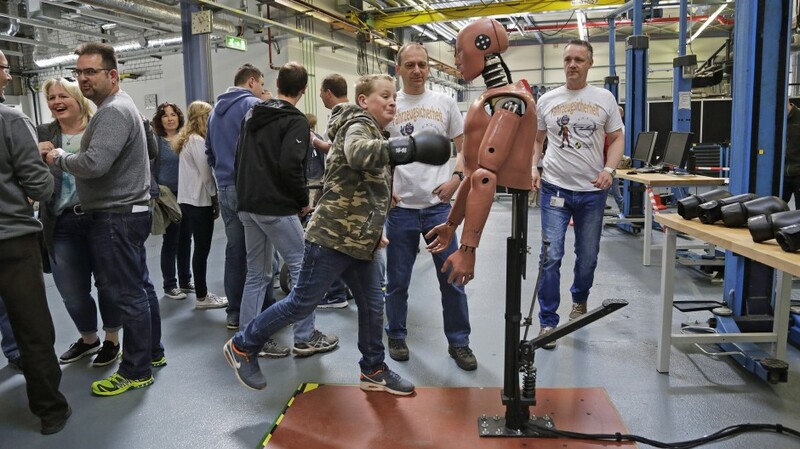 Dummy boxing is one of many infotainment stations that the employees set up for the family day last Saturday. A teddy bear demonstrates the centrifugal forces that a small passenger has to withstand when he hits an obstacle when not wearing a seat belt. The crash cars line-up is extremely impressive – authentic deliverables of the department. 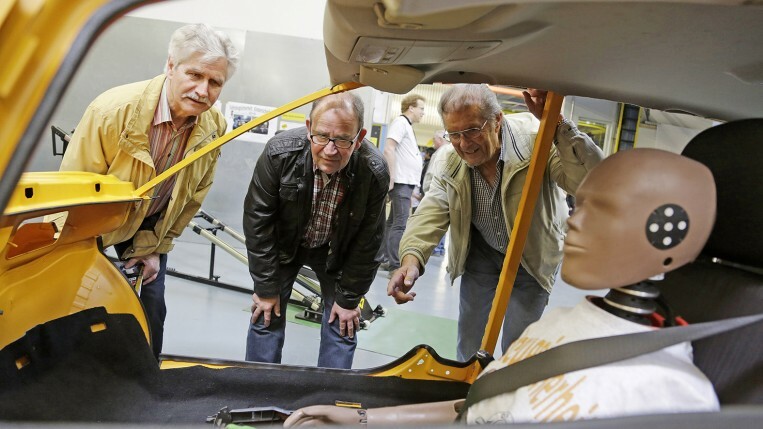 The Opel-Band “Treppenhaus B” is playing and Opel Classic has made exhibits such as the Moonlight-Roadster available – obviously, only after the Safety colleagues assured them that they would not be crashed for demonstration purposes. “We love our Opel oldies far too much to do that,” says Holger Hochgesand with a smile. The colleagues also love the current cars in the Opel portfolio but that does not stop them making an ADAM crash into a wall at 40 km/h. “Well, we wanted to give people an authentic insight into our work,” explains Holger Hochgesand. The courageous teddy races down the slope: He has nothing to fear as long as he is wearing a seat belt. Ninety Safety employees are on site to look after the visitors and various stands, to inform and to guarantee safety – but that is something they specialize in. It is not easy to organize a family event in the P area of the Rüsselsheim plant – an area that is normally extremely well protected from prying eyes. “The completion of P4 provided the ideal opportunity to invite our families and friends to have a look at our workplace after ten long years,” said the organizer. The superiors did not just support the plan; they are also on site to celebrate. Charlie Klein, Vice President Vehicle Engineering Europe, Wolfgang Schwenk, General Director GME Vehicle Development and Ken Morris, Vice President Global Product Integrity are all present. Holger Hochgesand can also welcome his American counterpart Albert Ware who is responsible for the safety tests in the US. Talking shop: It look like the crash-test dummy wants to get his point across too. 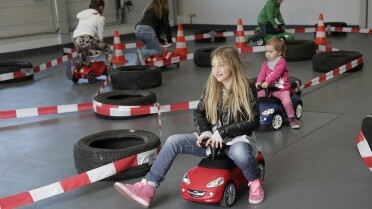 The bobby cars were also popular with the girls. 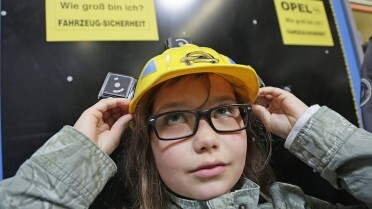 An intelligent face under an intelligent helmet: The sensors recognize how tall the person wearing it is. Safety first: The computer plays a major part in the work of Safety colleagues. 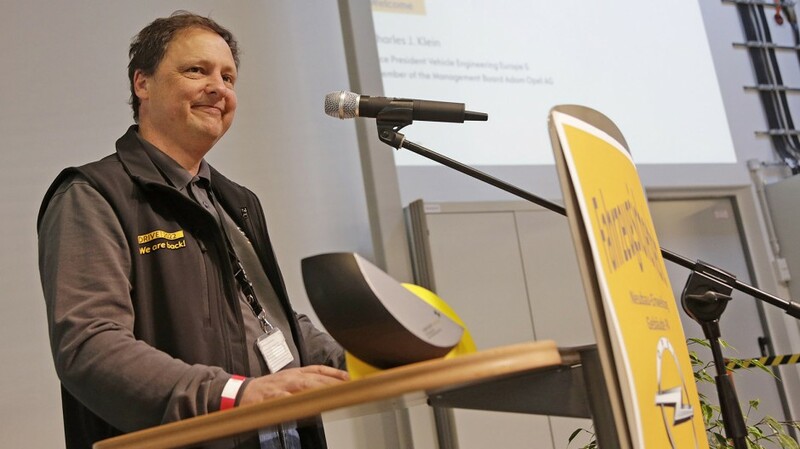 Günter Schmall, Director GME Vehicle Safety Integration, gave a review of 70 years of car tests at Opel – going back to the days when cars were covered in sandbag towers to test the stability of the roofs, right up until the era of computer-aided crash simulations. Posing for a photograph: At least a dummy doesn‘t pull a silly face. But what about dummy boxer Niklas Lang? He has made his mind up. “I want to work here when I am big.” Father Torsten is delighted. He is a group leader in sled operations. 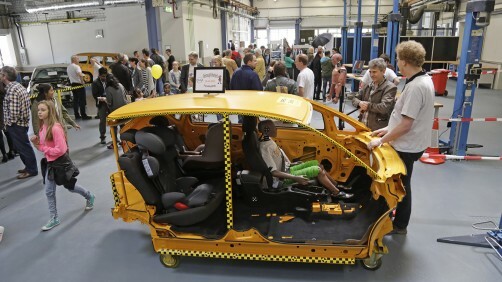 End of an ADAM: The visitors of the family days witnessed a live crash test.